The photo at left was taken from an internet site. The photos below are all mine. We stood in the same place but as you can see in the monument photo, it was clouded in. Fremont and his men still had to find a way down from the ridge to the lake below, and in the process rode several miles north and still had a mule roll over and over several hundred feet into a ravine, but “he recovered himself, without injury, other than to his pack”. We drove from Plush to Summer Lake in heavy rain and hail storms, and arrived at the campground happy to be protected from the wind and rain. Our campground host at the Ana Reservoir RV Park has to be one of the nicest we have encountered. He met us at the entrance in the rain, and talked our ears off before leading us to a nice pull through site at the upper end of the campground. We settled in, relaxed into the afternoon and decided that it was a good time to catch up on blogs and email since we again had a signal with the Verizon Mi-Fi. In this area Verizon works fairly well and ATT is just about useless. So no phone, but at least a slow internet connection gave us some catch up time. Our evening entertainment consisted of a walk around the campground viewing the very few other rigs that were there, and making sure we did each loop. The reservoir is down the hill a ways and we didn’t see any route down from the campground and with the threatening storms, decided that exploring on foot wasn’t on our agenda for the evening. Mo had finished her book and we thought maybe the little community of Summer Lake just three miles back might have something around for her to read. We found the Summer Lake Lodge, all closed up, and the Refuge Wildlife Loop, an 8.5 mile drive on soggy roads through the wetlands. Silly me, I had thought we were just going to find a book and didn’t have the camera with me that first evening, but we enjoyed the little outing and the birds, even without the camera. We then took advantage of the power hookups to watch a movie, “Dreamkeepers” about a young man on the Pine Ridge reservation who drives his grandfather to the All Nations PowWow in New Mexico. I loved the movie, it was filmed in some beautiful locations, including the Black Hills, and the characters were real, not dressed up romanticized versions of the noble Native American. Mo was less enthralled than I was with the “stories” that Grandfather told, but I loved all of it. Especially the Coyote and Spider silliness. It was great. The next morning we woke to stormy skies and rain after hard rain and wind for most of the night. We really wanted to see Fremont Point, and knew that the 18 mile trip on FS gravel roads might yield nothing but clouds, but it was still worth a try. The road leaves Highway 31 just a few miles north of Summer Lake, and travels up the beautiful Winter Ridge area of the Fremont National Forest. I also noticed that Highway 31 is called the Fremont Highway. No wonder! Traveling through huge old ponderosa forests higher into thick fir, we came to large burn areas left from the Tool Box Fire Complex that raged through in 2002, the same year that fires all over Oregon including the Biscuit fire on the southwest side burned more than 200,000 acres. Amazingly, I had five bars on my Verizon iPad and managed to navigate the fog and cloud shrouded roads to the overlook. As we imagined, the point was completely clouded in, and we could only see that there was nothing, just nothing, beyond the rocks at the edge of the cliff. I took the first photo at the beginning of this post from internet images to show what we would have seen if it had been clear. At the edge of the cliff there used to be an old cabin, once the residence for lookout personnel, that the Fremont National Forest would rent for overnight stays. It was destroyed in the fire, and now volunteers are rebuilding another cabin at the same location. We decided that a loop route would be more fun than backtracking and with the help of the BLM map, the iPad, and the gazateer, we managed to find our way south through the forest to the Government Harvey Camp Road that led down the steep escarpments to the southern end of Summer Lake. Looking down on the lake from the ridge when the skies opened up a bit was fascinating. The lake is so shallow and the bottom is white, and we couldn’t actually see where there was real water or just white mud. Someday I do have to go back and see the view from Fremont Point. Not far east from our intersection with the Fremont Highway was the Summer Lake Hot Spring Resort. I think the word “resort” is used loosely, but there are basic cabins there and an old historic bath house built in 1927 to serve hot spring customers. There is an inside pool, but it seemed kind of scummy and not that warm. In addition there are three outside stone man made pools for soaking. I stopped into the office and met the owner who said he would only charge me $5 to soak instead of the customary $10 fee, but there were a bunch of kids in the big pool and the stone pools I would have preferred were filled with soaking young couples. It didn’t excite me, especially after my little dip at Hart Mountain, so I declined. I can see that the outside pools would be nice if they were less crowded, and the fact that there is enough water exchange to not require any chemicals is a big plus. The views toward Summer Lake were beautiful as well. Too many of these developed springs are adding chlorine to their pools. Yuk. On the way back to camp, we decided that a good dinner at the well reviewed Summer Lake Lodge was in order since it was raining again and we didn’t really want to haul out the BBQ for the steaks I had thawed. The place looked rustic and fun through the windows, and even though the CLOSED sign said they would be open at 5, no one showed up. We talked to some couples who were staying in the cabins there and they were not happy that the restaurant wasn’t opening. Later our camp host told us the owners were basically just burned out and had the place up for sale. 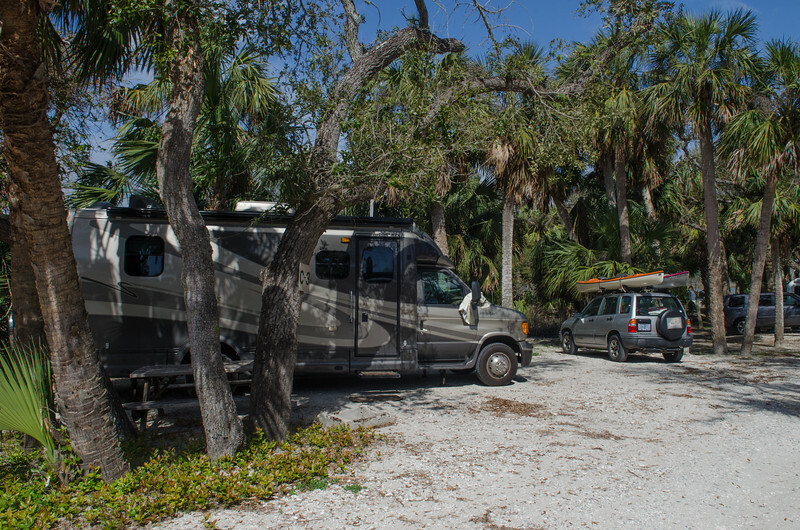 We decided to take another little tour on the wetland refuge road and try to get some photos in the rain of the campgrounds and the kayak launch on the Ana River. The skies opened up just enough to be gorgeous, to give us a very different and beautiful rainbow, and we added another boondock site to our list. It would be wonderful to camp here in late April or early May when the birds are here in force. The nice thing is that being only 150 miles or so from home, we can decide to come on a moment’s notice when there is a break in the spring weather. I must say the the Ana Reservoir RV Park was a surprise. Not only because of Jay, our host, but everything was so spiffy and clean, with an open fresh feeling. The second night we were there, most of the campers had left, since it seems that the park caters more to weekend types than full time RV’rs or retirees. There are no lights except for a small bulb over the washrooms, which are locked and the skies were completely dark. I think this may have been one of the quietest campgrounds ever. During the night it felt like we were almost as alone as we had been in our boondock site near Plush! If you are in the area and want some hookups I would highly recommend this little park. Just talking with Jay is fun enough to make it worthwhile. He gave us the inside scoop on the reservoir, where to kayak and put in and take out, the stories about the local people, and about Fremont Point. Our trip home was beautiful, passing Silver Lake and the road to Fort Rock, crossing the beautiful Klamath Marsh and connecting up with our very familiar route home Highway 97 through the Wood River Valley and safely into Rocky Point. Home looked lovely, except the cold snap had completely killed the dozens of buds on our three hardy azaleas. When the animal alarms went off at 5:30 this morning I looked outside to see crystal clear skies and a sun already nearly over the eastern face of the mountain. The magic hour, morning light. Rather than dawdle around, we got up and dressed, had our morning coffee and breakfast and were on the road east to Hart Mountain by 7am. The road to Hart Mountain follows a track east from Plush, past old homesteads and hay ground, through the Warner Wetlands and along the northern edge of Hart Lake before turning to gravel. I am a sign junkie, so was tickled to find the wetland interpretive sign I had seen somewhere in a brochure. I didn’t realize that the Visitor Information Center was simply a series of kiosks and some shade shelters with signs. I discovered once again why I need a fast! and much better telephoto for my Nikon 5100 than the cheapie one that I have. Those birds just refuse to come into proper focus no matter how many shots I try. No tripod probably doesn’t help, but I think it has something to do with the autofocus as well. When I manual focus it isn’t any better. Ah well, an Erin I will never be. Still, I included some of the photos just for fun to remember who was hanging around the wetlands. We continued north along the road, coming to the Hart Mountain Antelope Refuge entrance sign, with a small campground just inside the boundary called Camp Hart Mountain. Surprisingly, this nice little camp is just a step up from boondocking, and still free. The host couple told us that the Fish and Wildlife Service can’t figure out what to charge, so they left it free. There is potable water at the main shelter with picnic tables inside, very large open sites, and as I mentioned, a camp host. Nice for those long days when you leave your rig to go exploring on roads you might not want to take the big shiny RV. Continuing up the road as it passes along the east side of the Warner Wetlands, we saw a few other boondocking opportunities on some BLM land along the lakes, but the east side of the road is all refuge and not open to parking. As we started up the steep hill east into the refuge, we saw a small sign, “Warner Overlook”. Perfect place for a short hike to the viewpoint on a gorgeous morning. The desert stretches to the west, and the complexity of the Warner Wetlands follows the base of the ridge as far north as we could see. An interesting phenomena was the “bathtub ring” left along Poker Jim Ridge left behind when the huge Miocene lake receded as the climate went from moist tropical to dry desert over a few million years. There were lots of flowers blooming on the ridge, mostly varieties of Indian Paintbrush and buckwheats. It was a delightful walk. Continuing east into the refuge, the road is still gravel, but very steep until it tops over the uplifted ridge and the eastern desert stretches to the distant Steens. The Scenic Backway continues along this gravel and dirt road for many miles, all the way to French Glen at the base of the Steens. It is a beautiful drive. I have a friend from Rocky Point who said she and her husband towed their fifth wheel all the way to French Glen across this road, nearly 100 miles, but they would probably never do it again. I have no desire to ever take the MoHo even as far as the Refuge Headquarters just 20 miles or so from the valley! We decided to drive the Blue Sky road along the eastern edge of the refuge early in the day in order to see more wildlife and catch the early light. We hoped that this time we would be able to continue all the way around and connect up with the Hot Springs Campground in a full loop. We were a bit too early for many of the side roads which were still gated closed, including Skyline Drive, Black Canyon Road, and Old Military Road. It was on the southernmost edge of our drive that we saw the most wildlife. Pronghorn are not technically an antelope, although the refuge is actually called an antelope refuge. This time of year the herds are fawning and so are more dispersed than usual when hundreds of individuals can be seen racing across the hills. Pronghorn actually developed their incredible speed during a time when there were two species of cats similar to cheetahs that were their main predators. They can run up to 45 miles per hour. Combined with keen vision and speed, they are usually only subject to predation when very young or ill. The other wildlife species that is especially important on this refuge are the sage grouse, with a drumming chest and elaborate spring strut that is a renowned spectacle in the high desert springtime. We were a bit late for the courtship rituals, which occur in March and April. We didn’t see any sage grouse, but what we did see was gorgeous desert habitat thick with abundant grasses, healthy because no livestock grazing has been allowed in this refuge since 1994. We also saw areas that had been burned, as part of the habitat management to encourage more grasses and to stop sage from encroaching on the lush meadows, so important for the pronghorn. Continuing west toward the base of Hart Mountain’s east slope, we saw only 2 other people, a couple of guys on 4 wheelers. There are stern rules about not going off road, and it appeared that these guys were obeying the rules. The rest of the morning we had to ourselves. Keep in mind that this was Memorial Day Weekend, and people were few and far between. The last time we camped at this refuge was Labor Day in 2004, and back then it was just as quiet, with just a few campers in the Hot Springs campground. At the turn to what is called Blue Sky Camp and the road to Warner Peak, we were again stopped by road closed signs, and most disappointing of all, the road to Hot Springs was closed as well. Seems as though the only time of year to make this loop in a vehicle would be after August and before the fall snows. We had hiked the road from the campground end when we were here before, but this was just a day trip, and that hike wasn’t on the agenda for us. We returned the way we had come, stopping to try out another side road that was open and on the map appeared to continue across the ridge. Instead it stopped at a small rather nondescript little meadow at a place called Robinson Draw Day Use Area. Ok then. We used the day use area to have our snacks in the car and then drove back out to the main road and headed back toward the turn to Hot Springs Campground. The road into the campground was as we remembered, more decently maintained gravel for a few miles before you rise over a ridge and see the campground and meadow hot springs spread out beautifully below the snowy mountain above. I was excited about the hot springs, with wonderful memories of the white sandy bottom of the natural spring out in the meadow. We drove around the campground a bit, checking out the camp sites, including the one we used so many years ago. With the recent burning of sagebrush, it didn’t look very appealing, and another area had been opened up along another draw that seems a bit claustrophobic along the brushy creek. Finally we parked at the beautiful hot spring, surrounded by a stone wall erected many years ago by the Order of the Antelope. The spring itself is about a 8 x 10 foot rocky hole in the ground and the water is only about 97 degrees F at this time of year. It didn’t look particularly inviting at the moment, although I do remember great soaks there when we were here before. Instead, I wanted to wander out into the meadow to find my favorite little spring. There is was, a bit bigger than it used to be and a lot siltier. I ran back to the car to get a suit on and by the time I got back to the spring there was a bather already settled into the little pool. Hot Spring culture is often dominated by natural sorts of folks who really like to soak sans clothing and this was no exception. The nice guy floated in the water and was very friendly and conversational with me while his parts floated conveniently just below the surface. I wasn’t too anxious to jump in with him, but I sat on the edge of the grass and dangled my legs while we talked for some time about the springs and he pointed out the next small spring up the meadow. I wandered off to check out the spring, but it was incredibly small, with three different streams entering of different temperatures, and the only hot clean spot was about 2 feet wide and surrounded by saturated deep grass. Nah, maybe not. Then, as I turned around to walk back, I saw that the single bather at the first pool was leaving. Mo had been walking around with Abby, (she isn’t much of a hot springer), and I called her to bring the camera. I was getting in that pool and wanted the photo to prove it! Sure enough, it was warm, about 103 or 104, and while the silt on the bottom made it seem a bit murky, just under the silt was that nice hard sand I remembered. Abby decided that the pool was a little bit strange, with all that warm water, and I got her in, but not for long. It was wonderful to be in the hot water, with great minerals and no smell at all. There wasn’t a sign of sulfur in the water. and after it settled a bit, the water was crystal clear. My friendly bather had stirred up all the silt, I guess just to get a mud bath or something, but by the time I finished soaking the water had cleared beautifully. ahhh. We drove back out of the campground road, stopped at the refuge headquarters to talk about antelope and weather, and found that it had been 11 degrees F the morning before. Sure am glad we didn’t try to camp there then! It can be cold in these deserts! I picked up some brochures about the local birds and wildlife, and found a nice little brochure that lists 12 different day hikes that are available. There are also more than 200 bird species that have been recorded in the refuge and another brochure has a handy bird checklist. We decided to take the road north to Petroglyph Lake with a short 4 mile hike that leads to petroglyphs on the basalt walls on the north side of the lake. Instead, we found that the rough basalt rocks in the road were too much to try to do with a patched spare tire, and with several cars parked just beyond where we could drive, we decided that it wasn’t worth it. There were a bunch of hikers getting ready to do the trip with packs and walking sticks and it wasn’t exciting enough for us to deal with the people. I guess we are getting spoiled with all this alone time and space and people seem like a jarring intrusion somehow. We drove back down the steep gravel road with the gorgeous vistas of the Warner Wetlands and the desert, overlooking the distant sunstone digging area where we were yesterday, the white trailers just tiny dots on the horizon. On the way down, we saw a little sign to Warner Pond Day Use Area, and flipped a quick turn to follow a steep dirt road back up the face of the mountain slope. This road was really steep, and even in 4 wheel drive, the little Tracker did a bit of slipping and sliding. At the end of the road, however, was a precious jewel of a tiny fishing pond, even with a dock to launch a boat! We wondered just how anyone would haul a boat up that road unless it was on the top of their pickup. Our hiking on this trip has been limited for reasons not mentioned until now. When cleaning house before we left, I was rushing around the kitchen and slipped on the wet floor and slammed my foot into something or other, who knows. Mo was gone, I laid on the floor for a few minutes feeling sorry for myself, and my foot turned blue half way up the midstep. I think I broke my big toe. Not particularly fun, and not particularly conducive to any kind of lengthy hiking trips. At least I can still walk, but thought I might mention why we haven’t been doing much hiking on this trip. We traveled back home along the same route to our lovely boondock site, still empty and quiet and cool enough for Jeremy. The weather had cooled quite a bit and it looked like rain, so we settled in to relax, read, and nap till dinnertime. It would be Jeremy’s last day of desert freedom since our next stop will be in Summer Lake at an RV park, not likely a place where we can just let Jeremy out to play so easily. By late afternoon a few pickups and 4 wheelers drove past our campsite, waving to us, but no one attempted to infringe on our nice open boondock site. The site is big enough to easily accommodate several rigs, so I am glad no one decided to bother us. Ahh, let’s sleep in. Except no one told the dog and the cat. Abby has this thing, she shakes so that her collar rattles. Jeremy starts purring. Loud. Both of them begin this little ritual at exactly 5:30 AM. Not such an issue in a big house, but in a small RV? I think we did manage to sleep till 6am at least. The skies were clear and gorgeous, but we had no desire to run off in a hurry. Our plans for the day were to drive the 20 plus miles of gravel and dirt road to the BLM Sunstone Collection Area and root around for the Oregon state gem. No need to get out there when it was still in the 30’s, no matter HOW sunny the skies were. Point A is Plush, B is our boondock site, C is the turn off the hogback road E is the next turn and F is the digging area. Instead I made some rich, dark Seattle’s Best french press coffee, and toasted some of the sourdough bread we still had left over from the Bakkery in Mammoth Mountain to go with our yummy, leisurely breakfast. We settled Jeremy in with the Fantastic Fan set to go on if it got warm, loaded up Abby and snacks into the Tracker and headed north with our shovel, bucket, and 1/4 inch mesh screens Mo built for this day. The BLM roads show well on the map, and we also had several brochures I picked up from the Interagency Office yesterday in Lakeview with varying degrees of clarity describing the route. There are several private mines in the area around the public digging sites, but our first destination would be an area where we could just walk around and pick up the beautiful sunstones right on the ground. Why look for sunstones? Why not? We knew the chances of finding anything particularly valuable were slim, but sunstones are lovely little feldspar crystals, most often a clear pale yellow and sometimes pink, green, or shades of red depending on the level of copper inclusions. The Hogback road goes north from our boondock site near Plush and eventually will hook up to Highway 395 near Abert Rim, famous for hang gliding jumps. The Sunstone area is east of the Hogback, and the several roads and turns are actually well marked if you pay attention. Nice sized signs saying “Sunstone Area” are at each turn. The roads are all gravel, not dirt, and they are rough, with sharp stones. We had a spare tire, but if we did this again we might think about bringing two spares. UhOh. We had just arrived at the shade shelter near the digging site when Mo saw the flat tire. It wasn’t too difficult changing the tire, but we weren’t too happy about our plans to explore more rough roads later in the day without a spare. We also weren’t too happy about the fact that the nearest place to buy a tire was a very long way back in the town of Lakeview. Not to worry, we just decided to think about it later and get on with the adventure of looking for sunstones. The brochure for the sunstone collection area says to just keep your eyes to the ground, looking for the translucent yellow stones lying among the rocks. Of course, you can also dig, but are asked to fill in any holes you excavate. We spent most of our time walking the draws, thinking that the erosion would bring stones to the surface, but found out later that there are often more and bigger stones up on the flat areas northwest of the shelters. Large ant hills are everywhere, and sometimes they excavate nice sunstones and leave them lying around. We were a bit nervous about driving off into nowhere with a flat spare tire, so only wandered off less than a mile and took off walking again. In some areas around the anthills the sunstones were so numerous it looked like the ground was covered with glitter. Most of these stones, however are less than 1 or 2 mm in diameter. We found as the day wore on it took a bigger specimen to get us to bend over and pick it up. By the end of a couple of hours of exploring we had a nice little stash of glittering, lovely sunstones, and a few that were as big as an inch. We had planned to stop at the Spectrum Mine, just a couple of miles further down the road, but with the tire problem we thought it might be smart to stop at the Dust Devil Mine, located right at the entrance road to the BLM public diggings. We knew that our chances of finding a tire any closer than Lakeview were really slim, but still we thought it might be good to stop and ask. We had no desire to do what is called “Fee Digging” at the mine. We drove in and parked near the collection of old trailers and piles of mineral specimens. In a few minutes, an older guy with a big gray beard showed up and when we asked him about how far to a town with a tire, he said, “I think I may have one that fits out back”. Whew! In the mean time, Mo decided to take the punctured tire off the rack and as she did another guy came up and looked at it and said, “I can fix that!” and off he went with our beat up tire. Within moments he was back with a repaired tire and a warning to get it replaced as soon as we could. At least we had a spare to get us back to civilization. No charge. We all stood around and talked tires for awhile and they all insisted that we had to have 6 ply tires to drive these gravel roads without mishaps. Included in the conversation were lots of stories about 2 or more flats on a single trip. Hmmm, maybe a place for carrying 2 spares. We didn’t even carry two spares on the back roads of Alaska! They ended the conversation with an invite to watch how the fee digging worked. The equipment is all huge and crazy looking. The sunstones occur in the clay layer below the basalt where the feldspar cooled slowly enough to form large crystals. Varying levels of copper in the crystals lend the pink, red, or even combinations of red and green colors to the really fine stones. For 50 bucks, you get a hopper load of ore dropped onto a moving belt where you pick out the sunstones among the basalt gravels. Then you have to decide what pieces you want because you have to pay for “color” you wish to keep, at 1/3 the wholesale price. It looked fun, and the couple that was doing the picking had come from Red Bluff, California. They had found several pieces worth faceting in the past and the woman had some very nice sunstone jewelry to show for her efforts. Still, we hadn’t come expecting to pay for sunstones, we just wanted a little bit of collectible stuff and we already had that. After the belt was finished, the nice guy who had fixed our tire unlocked the main trailer to let us in to see some of the beautiful faceted sunstones they had for sale. There are several “fee digging” mines in the vicinity of the public area, and who knows how to decide which one to visit. Just on the basis of pure friendliness and fun I would highly recommend the Dust Devil Mine. Oregon sunstone was declared the Oregon State Gem in 1987 and the Dust Devil Mine started operating just a few years after that. The sunstones are only found in the remote high deserts of Lake and Harney counties. It is a great place if you like to rockhound and putter around in the desert. We had planned a different route home via a western route to the Hogback, but our guys (I can’t believe I never got their names) insisted that we shouldn’t attempt that route. They said it was longer and rougher and meaner. So we went back the same way we came, taking a little side road east to drop down into the Warner Wetland area and along the edge of Flagstaff Lake, one of the larger water bodies in the complex wetlands. Back up on the 6155 road, we passed a beautiful basalt cliff tucked into a western hill that looked inviting. Turning up the dirt road led uphill to another beautiful overlook site perfect for boondocking. The view east of the mountains was gorgeous, but the site was fully visible from the road below. The other down side is that this site was about an additional 7 miles of travel on rough gravel road. For some reason, we don’t want to do that in the MoHo unless absolutely needed. I laugh at this thinking about our 115 mile run on dirt on the Top of the World Highway in Alaska, but why do it if you don’t need to? If our current spot was filled, we might consider traveling north to this other site when we come back to this area. Once back at camp we settled in for a lovely late afternoon. Jeremy loves this site because he has free run of the desert. There are some sage surrounding the site, but he does a pretty good job of staying close and rolling in the gravel. We kicked back on the chairs enjoying the cool sunshine and I even took some time to practice my hand quilting before Mo started up the bbq for supper. Once again, we waited for a dramatic sunset, but the skies were subtle and the sun set in nothing less than a blaze of non-glory. Late Spring Snow and we are going camping?! Shingle Springs to Nevada City, and Friends!